A plastic magnesium-rich sodium hectorite clay of microfine particles (it is a refined version of the same material from which HPM20 and Volclay bentonite are made). One gram of the material has a surface area greater than 750 sq. meters! -Hectalite 200 has a viscosity of 2000-5000 cps @ 5% solids whereas GM is 50 cps. -GM has a slightly lower pH of 8-10 whereas 200 is 9-11. Hectalite 200 is intended for rheology control (stabilizing, gelling, suspending and binding household products, aerosols, paints, enamels and ceramic slurries) whereas GM is intended for binding and plasticizing in ceramic bodies. 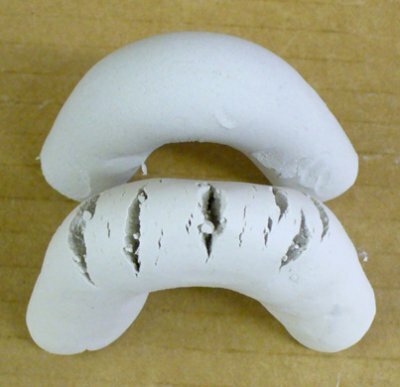 The high MgO, CaO and low Al2O3 give this material a chemistry that is unlike other typical fine particled clays. A comparison of the plasticity of Volclay 325 Bentonite:Silica 25:75 (top) and Hectalite 200:Silica 50:50. Both are mixed with silica powder. The latter (a highly refined bentonite) is much less plastic even though it is double the percentage in the recipe.